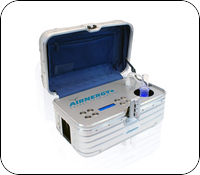 Those who don’t want to miss out their energy therapy while on the road can use the Airnergy TravelPlus anywhere at any time to get new energy. Thanks to the state-of-the-art battery similar to those used in aeroplane modelling, approximately 10 treatments are possible – no matter where you are and what electricity supply system there is. As in the two models “Professional Plus” and “AvantGarde” the “TravelPlus” is equipped with 4 catalysts and therefore it is possible to achieve the maximum of energy intake in an minimum of time. Recommended time per treatment: 20 minutes.